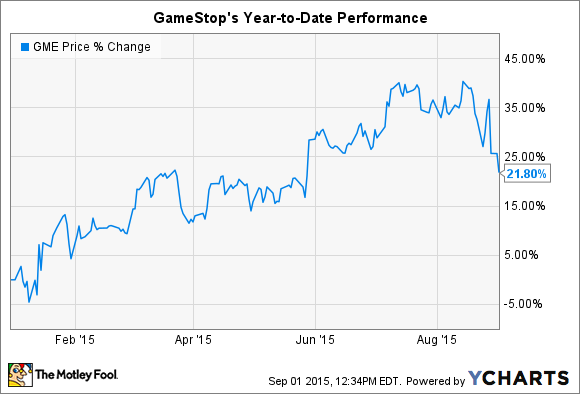 Is It Time to Sell GameStop Corp. Stock? Wall Street is all over the map with its projections for this video game retailer. You can't please all of the investors all of the time. GameStop (NYSE:GME) last week posted quarterly results that were solidly above expectations as it delivered an industry-thumping 8% comparable-store sales bounce. Yet the stock still fell by more than 10%. Sure, there are two sides to every trade. But Wall Street seems especially conflicted about this retailer. Reactions to the Q2 results ranged from a stock price upgrade calling for $57 per share to a downgrade predicting $29 per share. So, let's take a look at the two visions that have GameStop's stock either soaring or crashing by 30% in the next year. On the bull side, we have Piper Jaffray analyst Michael Olson, who reiterated a buy rating on the stock and boosted his estimate to $57 per share, or 13 times next year's projected profits. Olson sees reported earnings growing by double-digits in 2015, and again in 2016 thanks to an epic growth wave in the video game industry coupled with GameStop's continued use of cash to aggressively pare down its share count. There's plenty of evidence to support Olson's optimistic reading of the market. Next-generation video game consoles are flying off the shelves, and the installed base is close to double where it was at the same time in the prior generation's launch. GameStop is disproportionately benefiting from all of this excitement. It sold 42% more next-gen devices this quarter as its dominant grip on the software market strengthened: It's responsible for more than half of all video game sales for Xbox One and PS4 devices. That's how the retailer was able to book comps growth of 8% in Q2 -- on top of the 22% comps it posted in the prior year period. However, some pros on Wall Street see these gains as just a last gasp before GameStop slinks into obscurity. Benchmark analyst Mike Hickey lowered his price target to $29 per share last week on what he sees as the inevitable, brutal end to its core business. Those operations, "the physical distribution of hardware, software and used product through a traditional retail network," he said, "will be increasingly displaced from growing consumer adoption of digital / streaming / subscription content service channels." Digital sales will do to GameStop what they did to the music CD and movie DVD businesses, he implies. GameStop's collectibles business includes clothing and other licensed merchandise. Source: GameStop investor presentation. Hickey also dismissed management's move into other business lines as inconsequential to that dire thesis. He wrote that Benchmark is "unimpressed by [GameStop's] transformation into a mobile distributor/t-shirt, bento box, waffle maker retailer." Ouch. By that, he's referring to the company's surging non-video game businesses made up of cell phone services, consumer electronic sales, and most recently, collectables. Together, those products were responsible for 23% of profits last quarter, a number that GameStop executives expect to keep climbing over the next few years. My view is a lot closer to the bullish argument than to Hickey's. The digital gaming shift will eventually hit at the core of GameStop's buy-sell-trade retailing model. But management knows about this dynamic as well as anyone. It has a $1 billion digital business of its own consisting of downloadable content packs, full game download tokens, and its Steam and Kongregate platforms. Executives also know that physical retailing will always be central to the business, which is why they're expanding into other revenue streams. Mobile and consumer electronics have quickly grown to almost 10% of sales -- with nearly as high a profit margin, 45%, as GameStop's used game trade. The new collectables segment jumped to 6% of sales last quarter and comes with a sturdy 36% margin, too. If those are bento box sales, then they're very profitable bento box sales. And they're occurring while GameStop's primary business seems likely to dominate yet another holiday season in the surging video game market. That's a retailing outfit I'd rather buy then sell at the current valuation of 11 times earnings.